Long covered terrace with views over the olive groves and up to the peaks, a lovely place for dining and watching the birds. Horse riding can be arranged from the finca. Bike hire available. Lovely walks in all directions. FANTASTIC FOR BIRD WATCHING... an eagle owl is nesting in the woods, flocks of azure winged magpies, magical hoopoes plus the usual eagles, hawks and griffin vultures circling up in the crags. A path leads from the barn to the wonderful pool surrounded by beautiful shrubs and extensive views. The pool is shared with the cortijo of Finca al-manzil IF it is rented but it is in its own special place not belonging to either house, there is plenty of space and privacy for everyone.Pool opens on May 15. We love living in Extremadura enjoying the country life and exploring all the fascinating places near the finca. Pippa is from an arts background, for many years involved in interior design projects, Manfred has owned restaurants and tourist related businesses in Austria, Portugal and Spain. 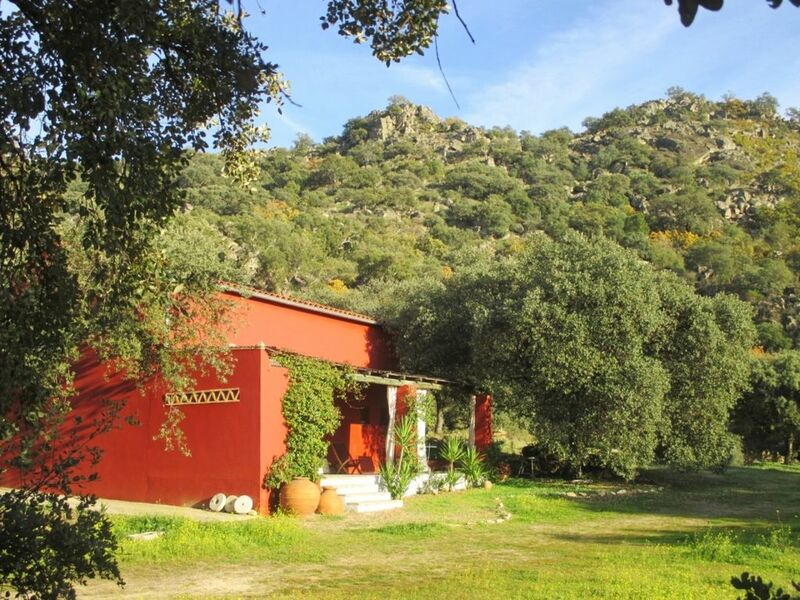 Finca al-manzil is well known as a great place to stay in stunning countryside, tranquility and a unique style, either at the cortijo for 6 or the barn for 2. It's a country estate with horses, extensive woodlands, mountain peaks, you are free to roam on the footpaths or the wonderful walk up to Montanchez. We are in a little world of our own. Tranquility in a healthy environment, pure air and mountain water. Comfortable houses with unique decoration, not typical tourist villas. Personal attention and advice about what to do and see. Well equipped kitchen with sunny aspect. The barn is situated in a beautiful mountain area, surrounded by nature, great for walking and bird watching. It is very private with its own grounds of one hectare and private entrance. It is within 40 kms of three historical towns, Merida, Trujillo and Caceres, all fascinating places to visit. We absolutely loved the barn! The barn is really beautifully designed for two with masses of airy space inside and a lovely covered porch where we spent a lot of time watching the birds in the meadow and in the copse of old holm oaks. Really comfortable and stylish with good quality furnishings and design features, two amazing old harrows hanging on the wall, very impressive. Besides lounging around the finca we explored the super scenery and visited all the historical towns within 30 minutes drive. Had some memorable food and wine and met some super friendly people. We have booked already for next spring. Thanks so much for the wonderful review, much appreciated, see you next year! Loved the barn, so peaceful, such a perfect spacious retreat for us. Lugar increíble, tranquilidad total, no hay TV ni wifi pero que mas da, lugares cercanos turjillo merida caceres,......., la pisicna la pudimos disfrutar toda la estancia nsotros solo lo que es un lujo.Resumiendo muy aconsejable. Please note that the map reference is incorrect, the finca is not in Albala the village but on a camino called Albalá del Caudillo near Arroyomolinos, the directions below are how to reach the finca. The first destination place names are Valencia and Córdoba. Follow these signs initially, but more importantly you are looking for the road numbers R5 and then the A5 which appear below the destination place names. Follow these road numbers heading South. Eventually the A5 becomes the E90 . The first destination place name on the E90 is Badajoz and then eventually Cáceres. Drive until Trujillo. Do not exit at Trujillo but continue until next exit to La Cumbre. Drive until you reach the village of La Cumbre and follow signs for Montanchez to right, continue for 20 kms until the roundabout at Torre Santa Maria, a busy junction, cross straight over towards Montanchez . At Torre Santa Maria follow signs for Montanchez until next roundabout with a bar called Parador de Padriño, follow signs for Merida and Alcuescar down hill, NOT Montanchez which is uphill. After 2kms take the left turning to Arroyomolinos at the crossing with Albala. Continue for 1km until you see the sign for Finca al-manzil on the left, an unmade camino. GOOGLE MAP REF for Finca al-manzil +39° 12' 27.54", -6° 10' 20.90"
N.B. REMEMBER TO DO SOME SHOPPING ON THE WAY, THERE IS A LARGE LE CLERC SUPERMARKET IN TRUJILLO. OUR LOCAL SHOPS ARE CLOSED ON SATURDAY AFTERNOON AND ALL SHOPS ARE CLOSED ON SUNDAYS.